Epaphroditus Ransom was born on March 24, 1798, in Shelburne Falls, Massachusetts, the first of 12 children. He received a good education at various New England academies and by 1823, he had opened his own law practice in Townsend, Vermont. Ransom was elected to the Vermont Legislature but decided instead that he wanted to move his wife, Almira, and their children to the Territory of Michigan. The family established themselves in what is now known as Kalamazoo. He began practicing law in the area, as well as involving himself in various business and agricultural ventures. It was not long, however, before he was drawn back into politics. 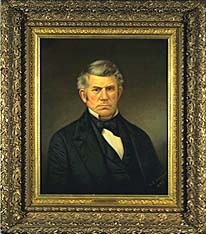 Ransom served in the State Legislature prior to being appointed a Circuit Court Judge and Associate Justice of the Supreme Court by Governor Stevens T. Mason in 1837. He maintained his service on the Court until 1848 when he resigned after being elected Governor of Michigan. Ransom was the first governor to be inaugurated in the new state capitol of Lansing. But his luck with politics and business began to change.